In my town, Lublin, Poland, nearly all the places of worship are in the Christian tradition. Although there are 350,000 people in Lublin, non-Poles and non-Christians are a tiny minority. There is one Islamic Center, and four “dharmic” religion centers, but no mosque or Eastern temple. The only choice left is a Jewish synagogue. In 1939, Lublin had 42,000 Jews, more than 100 Jewish synagogues, a Jewish hospital and orphanage, and one of the most important Yeshivas. Lublin was a cultural and political capital for Eastern European Jews. However, the Nazi occupation saw most Lublin Jews exterminated, and all but one synagogue destroyed. That one synagogue ceased to function in the 1980’s, because less than 10 Jewish males could be found in the area. It remained possible to visit it as a tourist, but services were very rare. 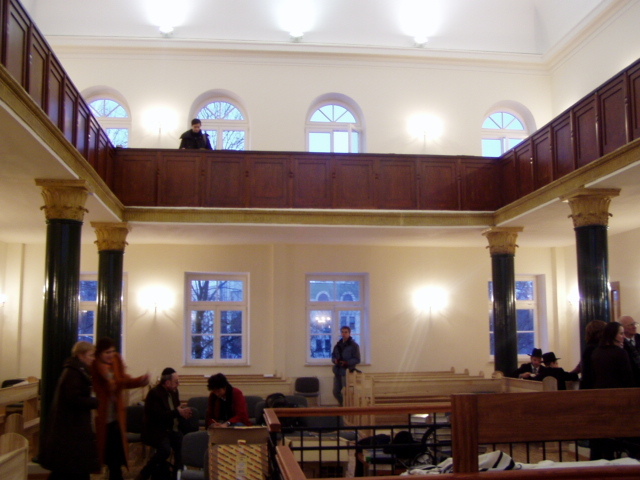 However, in 2005, the Chachmei Lublin Yeshiva was re-opened, and a synagogue was built inside, finished in 2007. 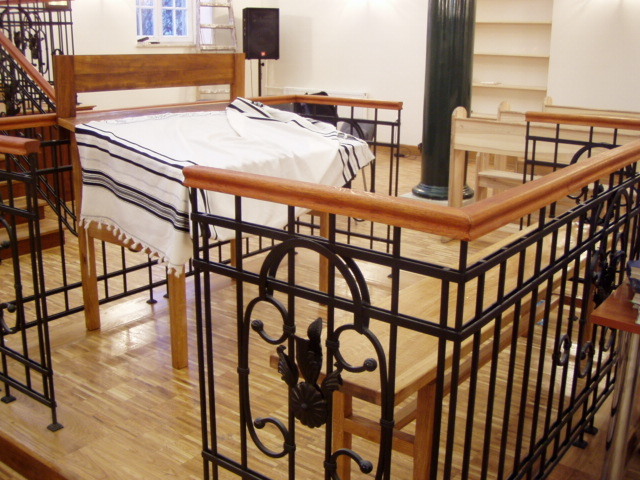 (More about the synagogue here: Virtual Shtetl)I visited this synagogue, but I think it is impossible to simply visit this prayer room without being mindful of the Jewish history of Lublin, and the incredible suffering involved. 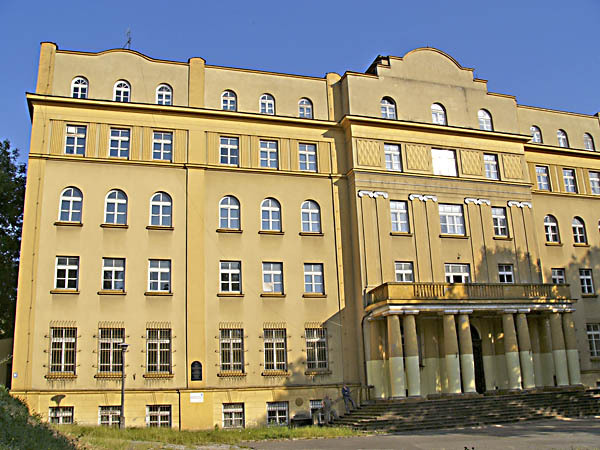 The Yeshiva and synagogue are in a building built in the early 20th century that was “appropriated” by the Medical College of Lublin after World War II, and was not returned to the Jews until the beginning of this century. Next to the synagogue are 3 rooms that show the history of the yeshiva and Jews in Lublin, with plans for a Museum of Hasidism. Although there are no pictures or other mementos of Jewish suffering in the main room of the synagogue itself, those rooms are only a few steps away. 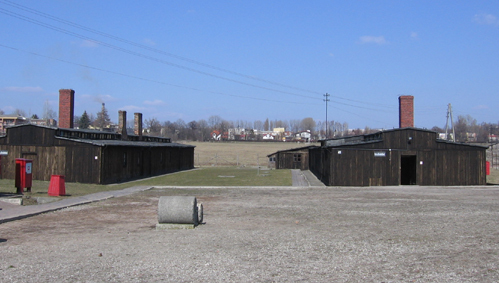 In addition, just two blocks away is the “New” Jewish cemetery, where thousands of tombstones and graves were bulldozed, crushed into gravel, and used to pave the entry road to the Nazi death camp of Majdanek. So, a Jew could march across the tombstones, and perhaps bones, of his ancestors as he made his way to the gas chamber. A short video tour of the synagogue can be found here: Virtual Shtetl video. This was my second visit to the synagogue, and this time I realized how similar the room was to a small Christian chapel. My first visit, I was struck by the differences, but this time the similarities seemed more striking. Of course, this is a new synagogue, so everything is freshly painted, the oak floors look brand new, and the bookshelves on the side of the room are still nearly empty. There are 7 wooden benches on each side, facing the front. Each bench has a small book shelf and reading shelf in front of it. There are also fabric-covered wood strips near the floor, in front of each bench, where a kneeler would be in some Christian churches. These strips are evidently foot rests, however. There are four Corinthian style pillars on each side, painted green, supporting a balcony. The synagogue has a side entrance, and there were no special requirements to enter, at least for a tourist like myself. Near the front, there were 2 center-facing benches on each side. I wondered who would sit here, but I noticed one picture from a special service in the synagogue that showed these benches turned to face the congregation, with what looked like VIPs in these front benches. There were also reading benches, with no seats against the front wall. These had indentations on the top front, the right size to hold writing utensils. There was another reading bench in the exact center of the room, facing the front, again with no seat. There was a raised platform (called a Bema) in the front center of the room , with another reading bench, no pen well. There was also a seating bench on this platform, far enough back from the reading bench that one would have to stand and approach it in order to read. The raised platform was surrounded by a cast iron railing to set it off from the rest of the room. The front of the room is dominated by a tall raised platform with steps going up to a large locked wooden cabinet (the Ark). The cabinet is oak, decorated with the same Corinthian pillars, topped by 2 round pieces – that looked like overturned goblets. The top center of the cabinet has a wood and gold emblem of the 10 commandments, with a red and gold crown on top. There are lions or lambs facing the crowns on the tablets. The walls have simple, normal Polish wall sconces with halogen bulbs, but one small menorah is on a shelf high on the front wall. A sign below the menorah said that it is a gift to the Jewish community in Lublin, in memory of 40,000 Lublin Jews killed in WW2. There is also a red electric bulb, made to look like an eternally burning flame on the front wall. There were also 2 Hebrew pages framed on each side of the large cabinet on the front wall. One thing seemed a little out of place – a small advertisement for a Polish flooring company attached to the base of the platform in the front of the room. (the section for women), but I could see some pages of text hanging on racks. There is also a large chandelier in the center of the room, with halogen bulbs, and floodlights around the top of the walls, pointed toward the high ceiling. I was interested by the similarities with Christian churches – especially Catholic – and by the fact that there was almost no sign of being in Poland. Adding insult to injury… there must be a special place in hell for ones such as these.